Fair. 0330288490 shelf wear to cover. E.L Doctorow's highly readable novels combine history, imagination, character development, a sense of time and place and beautifully controlled and paced writing. 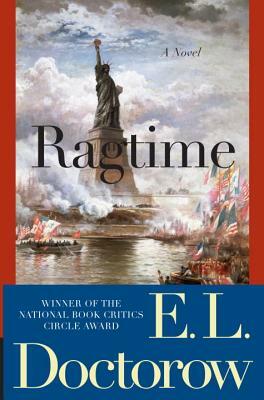 Doctorow's relatively early novel, "Ragtime" (1974) remains his best-known work. The book is a delight to read, moves with the feel of ragtime piano, and has a light happy surface. Yet the book combines many disparate threads and stories, a wealth of historical and fictional characters thrown together, and offers an unsettling vision of the United States at the turn of the century, c.1906. There is a complex, multi-layered vision at work here. The story is told in the first person in the words of Young Boy, whose parents are Father, a successful manufacturer of fireworks and flags in New Rochelle, New York, and Mother, an increasingly frustrated housewife. Mother has a brother, referred to as "Mother's younger brother" who is infatuated with a notorious, (and historical) beauty and femme fatale of the day, Evelyn Nesbit, and who becomes an expert in the use of explosives in Father's fireworks business. The story of this family slowly intertwines with that of a different American family -- Tateh, a Jewish immigrant from East Europe who at the beginning of the book is struggling as a silouette artist on Hester Street New York City, has young daughter, and Mameh, who through poverty and desperation has abandoned the family for a life of prostitution. There is a third fictitious American intertwined in the story. Sarah is a young (18 years old) black woman who has a young child that come to live with Mother while Father is away exploring the North Pole with Peary. Mid-way in the novel, we meet the baby's father and Sarah's suitor, an older black man and a pianist named Coalhouse Walker. Coalhouse has studied ragtime with Scott Joplin. The book is redolent with Joplin's music including "Maple Leaf Rag" and "Wall Street Rag." Coalhouse, in his dignity and his violent rage, quickly becomes the chief protagonist of the book. Doctorow has resurrected the character of Coalhouse Walker; and as a much younger man he plays a prominent role in his most recent novel, "The March" (2005), a fictional retelling of Sherman's march through Georgia and the Carolinas in the Civil War. But these characters and their interlocking stories are only a part of "Ragtime". Doctorow threads their stories in stunningly with stories of historical figures from early 20th Century America. The characters we meet include the escape artist, Harry Houdini, the anarchist Emma Goldman, J.P. Morgan, Henry Ford, Booker T. Washington, Sigmund Freud, Theodore Roosevelt, Scott Joplin, Evelyn Nesbit, her cuckolded husband, Harry Thaw, and her lover, the architect Stanford White, and several others. Some of these people have prominent roles in the stories while others have cameo parts. But their personalities in virtually every case shine through Doctorow's prose. For all the elan, rambunctiousness, and lyricism of the story, "Ragtime" presents a picture of a United States plagued by racism, poverty, and violence. The story pivots on Coalhouse Walker's attempts to assert his dignity and manhood in the face of a racial slur in New Rochelle. These efforts lead inexorably to violence and to destruction. The excitement, flow and complexity of the stories carry the reader along but the dark undertow is never absent. I think Doctorow is at his best in his portrayals of New York City in all its aspects. I was particularly impressed with his portraits of his life in the tenements with Tateh and his daughters, his scenes of the powerful in New York, (J.P Morgan and his meeting with Henry Ford), and the ubiquitous and lovingly-portrayed Emma Goldman. Doctorow's feel for New York City comes through in this book and in many of his later novels, including "Billy Bathgate" and "City of God". In its musicality, lightness, and depth, "Ragtime" is the work of a great American storyteller. It, and its author, are destined to become American classics. Interesting and it was needed for a class. He uses it because it's very informational. Easy to read, hard to put down. Well written, intricately woven stories that create a masterpiece of the turn of the century. Grrrrrrr8 Book.........+++++++.......Details life in the early 20th Century with a racial twist that mirrors the events of 911 when people are not treated over a period of time with dignity and respect.........Must read in order to learn from our errors and not repeat them. The book gives the reader a great image of the ragtime era and ties together all the characters in the book nicely. Incorporates some famous people.Great Read!